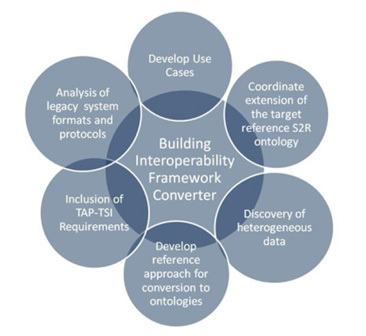 The diagram here below depicts the general approach for semantic interoperability that is adopted in the ST4RT project. The upper part of the diagram represents the “model” level: two different standards A and B are semantically annotated in order to create mappings from their data models to the global reference ontology – currently represented by IT2Rail ontology but possibly extended to a network of interrelated domain ontologies. The resulting mappings are the basis for the semantic transformations of ST4RT, so that data expressed in the two standards can be converted into their respective ontological version. The lower part of the diagram represents the “instance” level: whenever two systems that adopt the different standards A and B need to exchange information, the semantic transformation takes place. 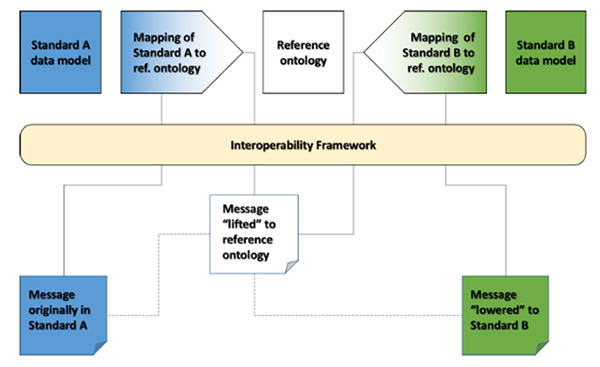 As in the depicted example, a message originally expressed with regards to standard A – because it is generated by a system adopting standard A – is “lifted” to its ontological version, by means of the mapping between standard A and the reference ontology; once in its ontological counterpart, the message can then be “lowered” to a message expressed with regards to standard B, by means of its respective mapping to the reference ontology, and can be consumed by the target system. Of course, the same procedure can be followed when the message exchange is initiated by the system adopting standard B: a message expressed in standard B is first lifted to the ontological version and then lowered to a message expressed in standard A to be consumed by the target system. Moreover, what is valid for message exchange can be also applied to web service descriptions: a service interface exchanging data expressed in standard A can be described in a machine readable way and its description can be lifted to the ontological level, by means of the respective mapping, and then lowered to a description expressed in standard B, by means of its respective mapping, and so on.